If your dog has dry skin or even dry flaky skin, it could be due to allergies. Two of the most common dog allergies are: dog food allergies and dog skin allergies. Here's how to tell if your dog is allergic -- by studying dog allergies symptoms -- plus an overview of which dog allergies treatments work best. Finally, these home remedies for dry skin on dogs will help to alleviate the excessive itching and scratching once and for all. Our veterinarian said dogs that spend a lot of time indoors during the winter months tend to get mild skin conditions resulting in dry, itchy, flaky skin. Guess what? A home remedy of Olive Oil will typically solve a dog’s dry skin problem! In fact, the Olive Oil works so well on my dog’s dry, itchy coat that we put it on his food every single day… year round! Does your dog scratch all the time? Maybe it’s dog food allergies — that’s what was causing my dog to scratch all the time. My dog had itchy dog allergies – here’s how we alleviated them. Plus, how to conduct your own affordable dog food trial and avoid a giant vet bill! Dog allergies can be very debilitating. The symptoms are enough to make you cringe. Fortunately, there are several natural cures for dog allergies that you can try in order to help relieve your dog’s allergy symptoms. If your dog has dry skin, he’s not alone. This is a common issue with dogs. See what our vet recommended — it worked for us! Plus all the best dog dry skin home remedies. If you have ever watched your dog scratching his ears he may have allergies. There are many different dog allergy symptoms to be on the look out for. Also there are several different treatments for dog allergies. Got doggy dry skin? Try an at home dog dry skin remedy! Here are a few simple things you can try. The one that seems to work best: olive oil. 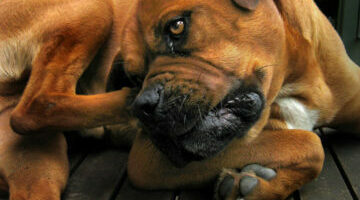 Dog Itching & Scratching: What Causes A Dog To Scratch All The Time? Trying to find a reason why your dog is itching and scratching lately? Here are some ideas. Plus some treatments and symptoms for dog allergies. Dogs are just as likely to suffer from allergies as people are. A dog’s immune system reacts much like a human’s immune system does. Here’s what to look for to help you determine if your dog is suffering from allergies or not. If so, you’ll want to get your dog to the vet immediately. Dogs can have allergies just like a person can. In fact, many dogs have many of the exact same allergies as people do. Here’s what to look for and how to treat dog food allergies, dog skin allergies, dog flea allergies, and dog inhalant allergies.